School administrators, clerks, students, and teachers can access SchoolTool using a typical web browser. Unlike PowerSchool, it does not require the Java Runtime Environment. Make sure you have these prerequisites before you begin. Now that SchoolTool’s repository is added to your server, update your server’s package list. SchoolTool will install a vast assortment of Python packages along with the SchoolTool software itself, so this can take a few minutes. Python is the programming language that SchoolTool is written in. Those of you who are experienced sysadmins will notice that SchoolTool does not require a LAMP stack for serving web pages or storing data. According to SchoolTool’s developers, the use of Python apps provides more stability in day-to-day operation and during program updates. By default, SchoolTool is accessible only from the computer where it's installed. In this section, we will open it up to public Internet access. Open SchoolTool’s paste.ini configuration file on your server in nano, a terminal-based text editor. Use the arrow and BACKSPACE keys to replace 127.0.0.1 with 0.0.0.0. Press the Y key on your keyboard to save your changes to the configuration file. To apply the changes to SchoolTool, you will need to restart it. Now you can take a moment to view SchoolTool in your browser, to make sure everything is working so far. Open your browser, and visit the URL http://example.com:7080 or http://your_server_ip:7080, depending on your desired configuration. Note that for now, you need to add the :7080 port number. The next section will show you how to access the server on the default port (80), which should make it easier for more users to access. You should see the default calendar page. SchoolTool’s default port is 7080. However, most users will be more comfortable accessing it on port 80, which is one of the normal ports used by web browsers. That means people will be able to access the server at example.com rather than example.com:7080. If you do not have any programs (e.g., Apache or Nginx) using port 80 on your server, you can change SchoolTool’s default port to 80 by following the instructions in this section. If you already have a program on your server that uses port 80, you will have to use the default port 7080 or create a new server specifically for SchoolTool. You can use iptables to forward port 80 to port 7080. Assuming your server is connected to the internet using the interface eth0, use the following commands to accomplish this. 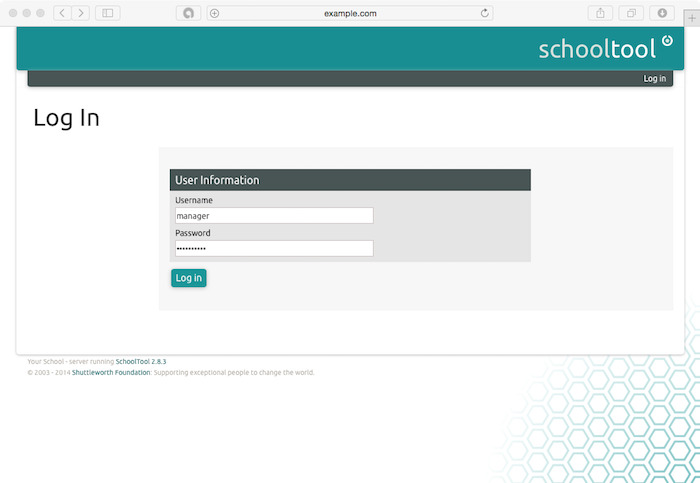 Now you will be able to log into SchoolTool using the URL http://example.com or http://your_server_ip, depending on your desired configuration. Use your favorite web browser to access SchoolTool. 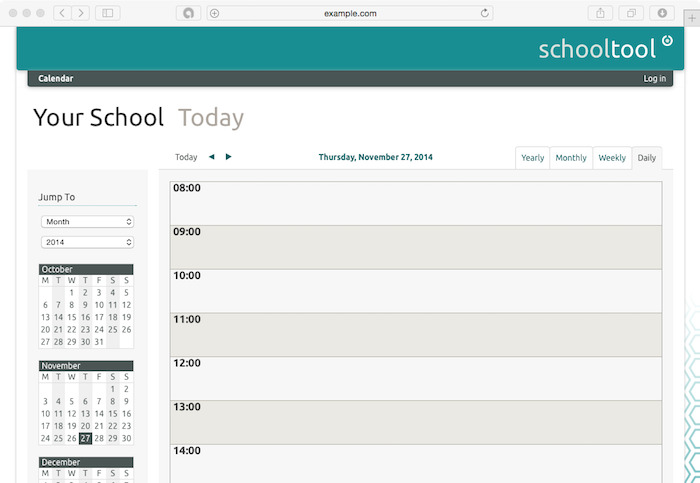 SchoolTool’s home page is the Calendar page by default. In the upper right-hand corner, click on the Log in link. Then press the Log in button to log in. You're now logged in to SchoolTool. First we'll update the password for the manager account. Do not leave this with the default password; otherwise, anyone could log into the account. Click on the Home tab in the navigation menu located at the top of the web page. Next, click on the Settings > Password link in the left-hand navigation menu. 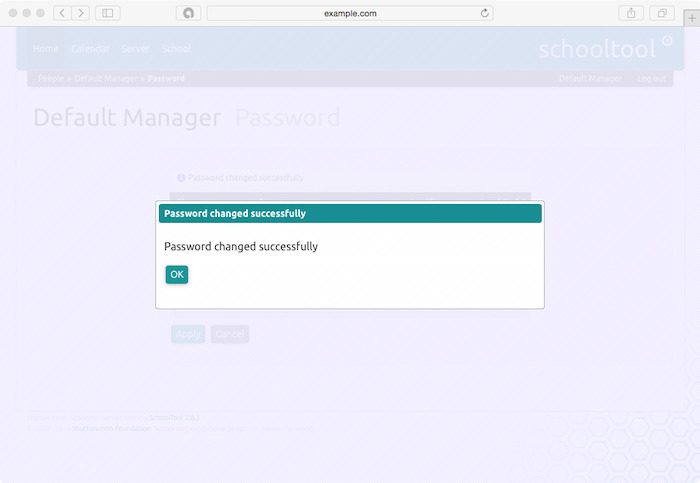 Type in the current password, schooltool. Then type in your new password twice, and press the Apply button. Please choose a strong password. A Password changed successfully popup will appear. From now on, you should use this password to log in to the SchoolTool control panel. Next we'll change your school's name and logo. Click on the School tab in the navigation bar located at the top of the web page. Then, click on the Customize > School Name link in the left-hand navigation menu. Replace Your School with the name of your school. In this tutorial, we'll use TechSupportPK Academy. Click on the Choose File button to upload an image from your computer to use as your school’s logo. Once you have selected an image to use, press the Submit button to save your changes. When the page reloads, SchoolTool will use the name and logo of your school instead of its defaults. Now that you have installed SchoolTool, you have a free alternative to BlackBoard or PowerSchool that will allow your school to manage student records from a browser-based application. You'll want to add teachers and students, set up grade books, and more. 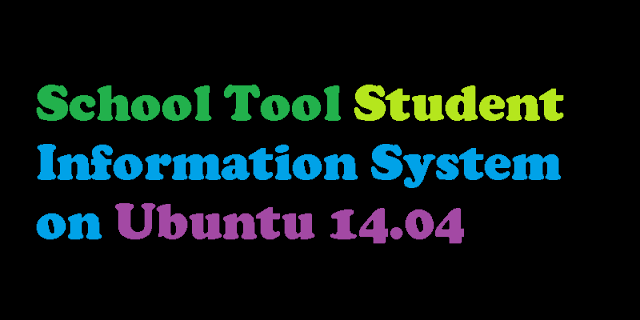 To access the full SchoolTool manual, refer to The SchoolTool Book, a knowledge base maintained by the developers of SchoolTool.